Good PR? 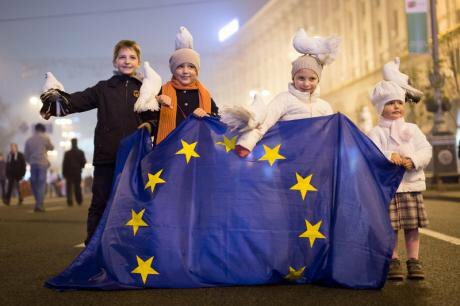 Ukrainian children holding the EU flag. Demotix/Oleksandr Ratushniak. All rights reserved. In October this year, the European Union’s Directorate General for Development and Cooperation (EuropeAid) published a review of the main activities and results of the European Neighbourhood and Partnership Instrument (ENPI), the major EU funding programme for the countries in its eastern and southern neighbourhood between 2007 and 2013. The report consists of tables with the major budget lines, brief overviews of the main priorities in each of the southern and eastern 'partner countries', and pictorial illustrations of ENPI funded activities. It is an easily available source of information to understand what the EU is doing in its border regions, and provides a snapshot of the diverse activities taking place in EU-neighbourhood relations. Short of being an exhaustive documentation of the many facets of EU influence in these regions, the ENPI review provides us with an idea of the image the Union aims to give of its neighbourhood activity. From this glossy version of the otherwise grey and unapproachable nature of EU affairs, we gather first of all that the Union is concerned with its self-representation: pictures of children sporting t-shirts with the blue and yellow starry flag while engaging in playful activities indicate an appreciation for public relations, in line with the demand for visibility in the crowded field of development and assistance. The report also indicates the extent of EU money flowing into these regions: over the seven year period, €13.4 billion was committed through the ENPI mechanism for an area stretching from Morocco to Ukraine, covering areas as diverse as security and justice system reform, social cohesion and economic governance. Looking at the data for the southern neighbourhood, for example, it is clear that ENPI funds are unevenly spread across policy sector and country, ranging from the €2 billion made available to Palestine, to the meagre €83 million allotted to Libya. Looking at this document beyond the budget lines however, we may ask which story the review is actually trying to cement. After decades of critiques directed against the image of the Union as a ‘Normative Power’,[i] primarily concerned with promoting good values and sound governance as part of its foreign policy, it has become clear that the EU is as realist as any other actor, most notably in the field of migration, but also in its trade relations, energy policies, and as a political project at large. [ii] It is therefore noteworthy how the ENPI review continues to espouse an image of the EU as a benevolent big brother, aiding its neighbouring countries on their path towards prosperity and development. The text [iii] is quite instructive in this regard: the EU is “developing a special relationship” where it seeks to “establish an area of prosperity and good neighbourliness”, “founded on the Union’s own values.” Promoting these values entails “enhancing democratic governance, building security and supporting democratic, sustainable and inclusive development.” Moreover, the EU is particularly keen to show that the “Arab Spring” is leading to a change in the intensity and scope of cooperation with the southern neighbourhood: it introduced the principle of “more for more,” which, in a “spirit of co-ownership and partnership,” would ensure “more attentive listening to the needs of partner countries.”[iv] Through the – suggestively named – SPRING programme, ENPI provided more money and more support to civil society, while offering Deep and Comprehensive Free Trade Agreements (DCFTAs) and mobility partnerships regulating migration to southern neighbours, demonstrating a commitment to change. Neat tables outlining the billions spent in each country, and the above-mentioned happy children dressed in EU flag t-shirts complement the text. In the ENPI review, the big story is thus one of a Union whose activities in its neighbourhood are based on projecting its values while ensuring good neighbourliness, in respect of the needs of each “partner country”. What is clear, however, is that there is an even bigger story taking place, beyond the Union’s realpolitik. It is indeed fascinating how countries that are not on the road to EU membership do adopt EU regulations. The DCFTAs provide a case in point: DCFTAs aim at initiating a process of positive integration based on regulatory convergence, as opposed to negative integration, which classic trade agreements address through the dismantling of protective barriers. But convergence remains a fuzzy concept in EU policy. Traditionally, convergence means a process by which two or more parties gradually change so as to develop common features. Yet this is not the understanding of convergence in EU external trade relations: instead, it means that third parties in the neighbourhood adopt the relevant set of rules codified in the acquis communautaire of the European Union. Indeed, integration, in the area of trade with ENP countries, means aligning the legislation with the acquis, so that products are treated as internal products. Integration is thus more than agreeing on equivalents: as a comparison, the EU-US Trans-Atlantic Trade and Investment Partnership (TTIP) is based on the mutual acceptance of equivalent standards, not on regulatory convergence. The EU’s approach to neighbourhood countries negotiating DCFTAs is therefore not to be understood in such partnership-oriented terms after all. The bigger tale of the ENPI is thus one of radiation of power beyond the orbit of formal control, and of the export of norms and practices into the borderlands surrounding the centre. By gradually changing domestic structures in other sovereign entities – through aid, assistance, twinning, technical training, negotiations over free trade, or through the myriad of other tools available – EU power is subtle and often concealed. The ENPI’s days are gone as the EU substitutes it with a new instrument, the European Neighbourhood Instrument (ENI). While, perhaps tellingly, the “Partnership” in the acronym of the new instrument disappeared, it is worth reminding ourselves that this is an exercise of twnety-first century power projection. It is not a charity project: where EU norms govern, the European project expands. [i] Ian Manners, “Normative Power Europe: A Contradiction in Terms?,” Journal of Common Market Studies, 40, no. 2 (2002): 235–58. [ii] Adrian Hyde-Price, “‘Normative’ Power Europe: A Realist Critique,” Journal of European Public Policy, 13, no. 2 (2006): 217–34; Michelle Pace, “The Construction of EU Normative Power,” Journal of Common Market Studies 45, no. 5 (2007): 1041–64. [iii] Directorate-General for Development and Cooperation - EuropeAid, European Neighbourhood and Partnership Instrument 2007-2013: Activities and Results (Brussels: European Commission, 2014). [iv] See also EEAS and European Commission, A New Response to a Changing Neighbourhood: A Review of European Neighbourhood Policy, COM(2011) 303 final, 2011; European Commission and High Representative of the European Union for Foreign Affairs and Security Policy, A Partnership for Democracy and Shared Prosperity with the Southern Mediterranean, COM(2011) 200 final, 2011; Jean-Pierre Cassarino and Nathalie Tocci, “The European Union’s Mediterranean Policy after the Arab Revolt: From Crisis to a New Order,” in Regions and Crises: New Challenges for Contemporary Regionalisms, by Lorenzo Fioramonti (Basingstoke: Palgrave Macmillan, 2012). [v] Sandra Lavenex and Frank Schimmelfennig, “EU Rules beyond EU Borders: Theorizing External Governance in European Politics,” Journal of European Public Policy 16, no. 6 (2009): 791–812; Sandra Lavenex, “EU External Governance in ‘Wider Europe,’” Journal of European Public Policy 11, no. 4 (2004): 680–700. [vi] See for example Frank Schimmelfennig and Ulrich Sedelmeier, The Europeanization of Central and Eastern Europe (New York: Cornell University Press, 2005); Vera Van Hüllen, “Europeanisation through Cooperation? EU Democracy Promotion in Morocco and Tunisia,” West European Politics 35, no. 1 (2011): 117–34. [vii] This point is elaborated on in Raffaella A. Del Sarto, “Normative Empire Europe: The EU, Its Borderlands, and the Arab Spring” (paper presented at the 8th Pan-European Conference on International Relations, organised by ECPR-SGIR and EISA, Warsaw, 18-21 September., 2013).